This enduring classic tells of the fantastic voyages of Lemuel Gulliver, an English ship's surgeon who becomes a castaway in strange and faraway lands. Shipwrecked upon the shores of Lilliput, he encounters the six-inch-high Lilliputians, whose petty wars, civil strife, and vanities are human follies so reduced in scale as to be rendered ridiculous. From there he travels on to Brobdingnag, where he finds himself surrounded by crude giants who cannot appreciate his abstract intellect and prefer to display him as a curiosity. Further voyages take Gulliver to the floating island of Laputa, a land of intellectuals who are ignorant of practical life, and to the Island of Sorcerers, who share with him the lies of history. Finally, he visits the land of the Houyhnhnms, a race of wise and gentle horses served by degenerate human-like creatures. 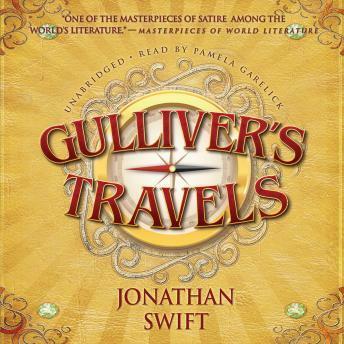 Gulliver's travels are entertaining adventures that also offer him new, bitter insights into human behavior. Both an amusing fantasy and a devastating satire of society, Gulliver's Travels is as witty and relevant in our own age of hypocrisy and irony as it was in Swift's eighteenth century.